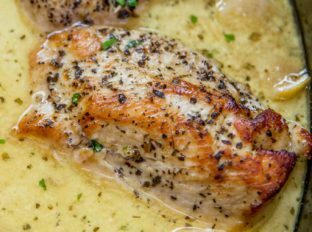 Slow Cooker Creamy Lemon Chicken with butter, garlic and lemon coating tender chicken breasts in a creamy sauce. Even great as a pasta topping! 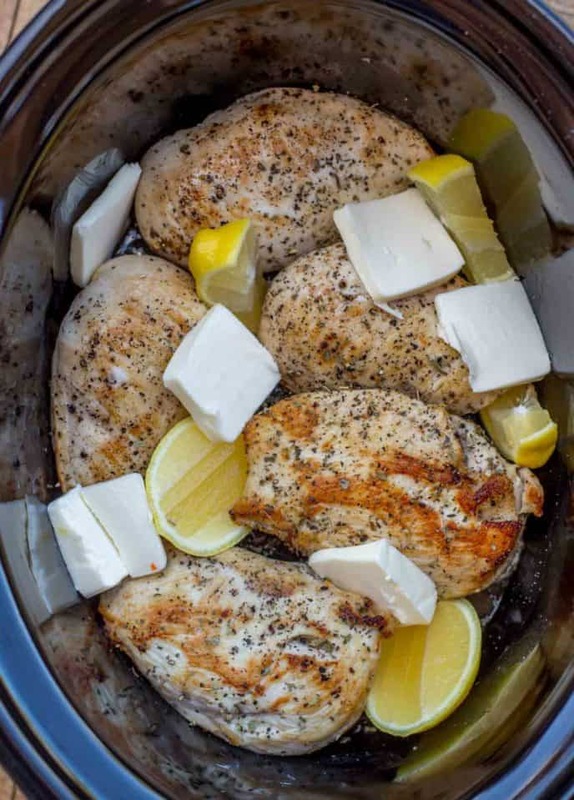 Slow Cooker Creamy Lemon Chicken bucks the general rule of thumb I live by with slow cooker chicken recipes. I almost NEVER add chicken breast to a slow cooker. My Slow Cooker Thai Peanut Chicken is one of the only exceptions on the site along with Slow Cooker Indian Butter Chicken. 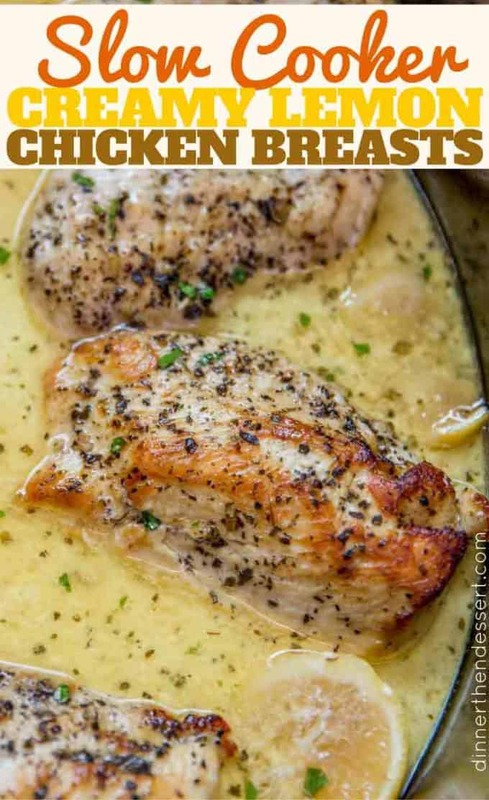 This recipe uses chicken breast meat but it would be completely amazing and delicious with chicken thighs. The reason I avoided chicken thighs in this dish was I didn’t want all the extra fat to render because the sauce would’ve been too greasy. 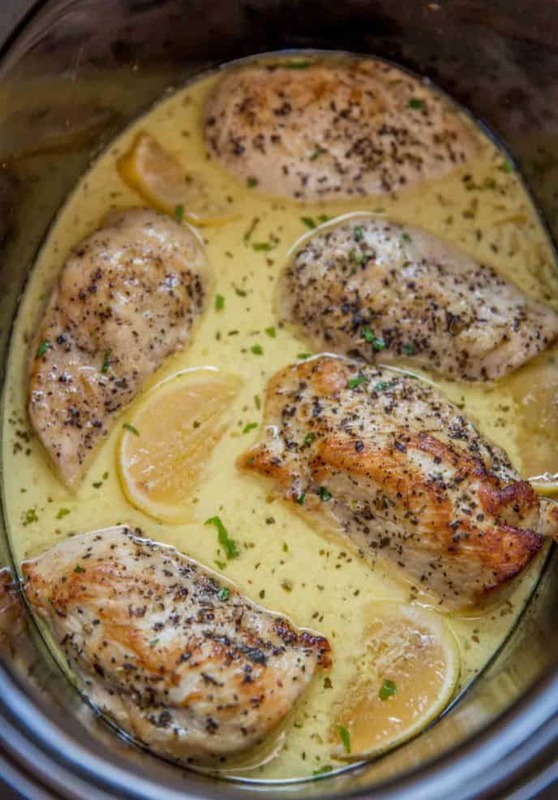 I also wanted to note that even though you see the lemon wedges in the slow cooker before pic, you only use the zest and the juice in the recipe. I just loved how pretty it looked. Don’t worry, I’ve lowered the cook time to account for the use of breast meat. 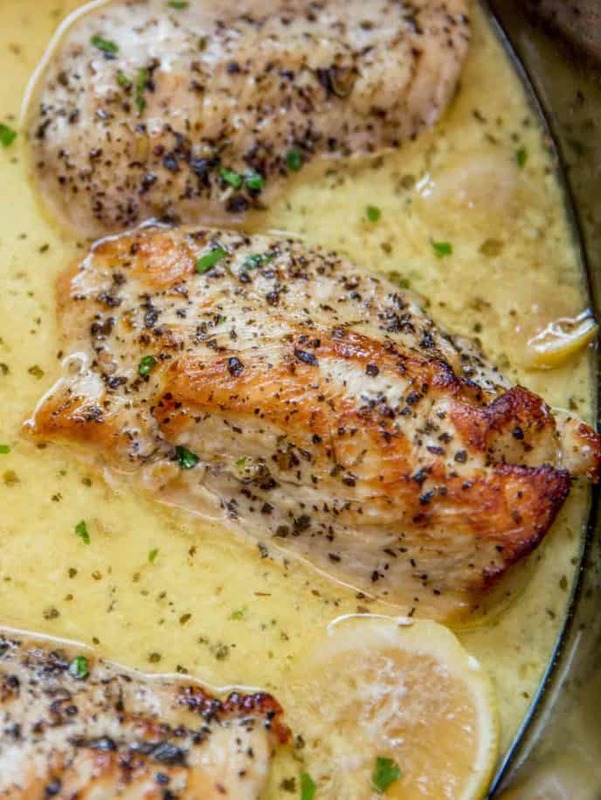 And if you want to make this Creamy Lemon Parmesan Chicken instead, add in 1/2 cup shaved Parmesan cheese. Note: shaved Parmesan cheese is different than shredded or grated. Cut it up and add cooked pasta to the slow cooker to make a creamy lemon pasta. Chop the chicken and add to the top of a baked potato with some of the sauce spooned over it. 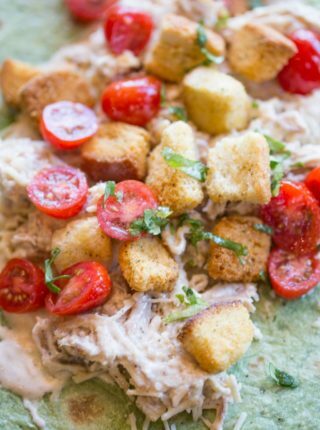 If you have leftovers you can use the chicken in salads, it is full of flavor. 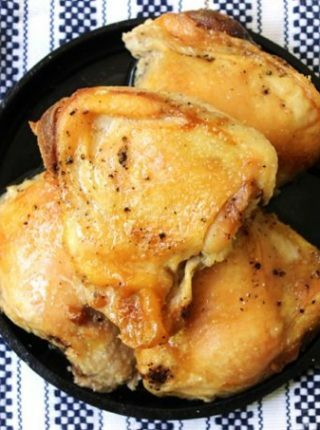 Slow Cooker: This recipe was made in this slow cooker. For larger roasts I also brown the meat in the insert and not lose a bunch of the flavor by transferring the meat and leaving the browned bits behind. If you’re thinking of a new slow cooker, consider it if your budget is open. Pig Tail Flipper: I use this to flip the chicken breasts easily. I use this tool EVERY time I cook something that requires flipping, it is amazing. 1 tablespoon chicken base optional, but delicious! Cook on each side for 4-6 minutes. Cover with lemon juice, lemon zest, garlic and the rest of the butter in pieces (I added the lemons in the before picture just for reference. Don't cook the lemons in the slow cooker). In a large measuring cup add the half and half, cornstarch and chicken base and whisk well. This is so, so good. It’s the perfect Keto meal. I just want to DRINK that sauce!! Haha, I won’t judge you! So glad you love it. Would you recommend a vegetable that you could add in? I would recommend making your vegetables separately so you don’t over crowd your slow cooker. Yes, you’ll want to cover it with the lid while in the slow cooker. Enjoy! This was absolutely amazing. So delicious. Next time I may add more lemon juice. Hello. This recipe looks delicious and I’d like to try it but I am wondering if I can make this with canned or any other version of coconut milk instead of using half and half?? I haven’t tested it but it sounds delicious! I’d love to know how it turns out. This is amazing! First time I made it, I followed the exact receipe. The second time I made it, I waned to lighten it up. I cut the butter in half and replaced some of the half and half with chicken stock. It was just as delicious! Served over bowtie pasta. Delicious! My kids have not usually been fans of creamy sauces or lemons but I tried it anyway and I’m so glad I did. 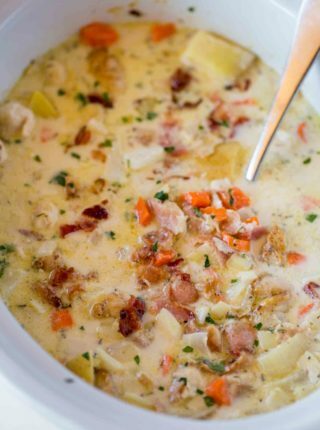 We had this over pasta and it will definitely become part of our regular rotation! So happy everyone enjoyed it. Thanks for taking the time to come back and let me know. I failed to read the recipe all the way through. My mistake! I put everything (except the lemons) into the slow cooker. I mistakenly added the half-and-half mixture with everything else instead of waiting for the remaining hour. I hope it turns out ok…? Oh no! How did it turn out? I made this dish tonight and it was a hit! DEFINITELY keeping this recipe! 5 stars! I served it both over rice for my hubby, and next to a side salad for myself! I also threw some fresh cut green beans into the pot, HELLA GOOD. Thanks, Monika! So glad everyone loved it! Half and Half is a simple blend of equal parts whole milk and light cream. You’ll find it in the refrigerated case by the milk. Absolutely loved this recipe!!!! So simple and tastes great!!!! The second recipe of yours I’m trying tonight. I’m having an issue with the timing. I’ve followed directions to the T but I’m 2 hours deep and my chicken is reading 169 degrees. I don’t want it to dry out (which happened with the last recipe) so I just skipped ahead 2 hours and added the sauce and put on high for the last hour. Will be back to edit when done. This has become my wife’s favorite dinner that I make. We love it so much! Could this be cooked in an oven? Also made in large quantity for a wedding? You can make this in a dutch oven at 325 degrees for 3 hours. You’ll need to make sure not to overload the dutch oven though so using mulitple ones would help. Enjoy! This recipe was delicious! I was afraid the lemon would be overpowering but it was perfect. I did this as a freezer meal. I put the ingredients from the first part of the recipe into a freezer bag (I didn’t brown the chicken). Then I thawed overnight and put it in the crockpot for 4hrs, and then added the rest of the ingredients per the recipe to cook for another hour. I shredded the chicken and added some steamed broccoli at the end. Amazing! It probably would have been even better if I had browned the chicken like the recipe said, but I was in a hurry, and I’ve been testing recipes to put in the freezer for when baby comes ? So happy to hear you were able to adapt it to the dutch oven. Thanks for the 5 star rating! I don’t like lemon but tried this as it is my aunts favorite. We all loved it! I wish I had left overs but not one bite was left. I wish I knew what to do to make more sauce for it. How could I increase the sauce volume without diminishing the taste? Feel free to double the sauce ingredients. Enjoy! I always hate when something says creamy and then turns out to be more runny than expected. THIS IS NOT THAT RECIPE. This is a recipe that is in our weekly rotation. The chicken and sauce are bursting with flavor, and it is easy enough that I can do it while entertaining a two month old! I do just use lemon juice, but that didn’t affect the recipe at all for me! Thank you for this recipe! Woohoo!! Thanks so much for taking the time to come back and let me know, Abbey! I made this tonight and it is amazing! It’s my new go to dish. I poured the sauce over angel hair pasta with capers and sun dried tomatoes…??? Thank you!!! My son has a Lactaid Allergy. Can the half and half be substituted for lactaid milk? Thanks for the suggestions, Bruce! I didn’t even make it to the last step of adding the half and half, (didn’t read ahead and factor in an extra hour of cook time) but this chicken was delicious! Even my very picky toddler said it was good. I have question! Can I use instead half and half and cornstarch—- (heavy whipping cream)?and if I will put young yellow potatoes , do I have to add water and are potatoes should be on bottom and chicken on top? It’ll be a bit thicker but should still work. No need to add any water for the potatoes. Hope this helps! This recipe is SO good! 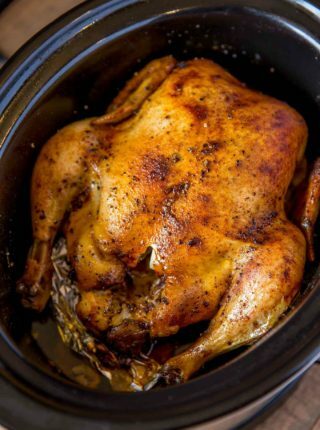 I go through these phases where I get sick of chicken (and other meats) but this is one I could eat all the time! I think searing them in the pan and then the sauce combination is really delicious. I’ve made this 3 times in the the past month or so and am making it again tonight. It’s great with pasta and I could eat the sauce by itself really! Love that this has become such a favorite for you! Thank you so much for letting me know. Why do you have to cook the chicken in a pan first? It just locks in the moisture of the chicken breast while it’s cooking. The only complaint I have about this dish is that I wish I had doubled the recipe. This was a huge hit with my family. I actually used thighs instead because I already had them on hand but I cannot wait to make this again. It’s definitely going to be part of my rotation. ? Love it!! I take that as a huge compliment!! I just made this again and HOLY MOLY it was even better than I remember! I wish I could give it 10 stars! ? That’s so sweet of you to say. I’m so happy you love it! Oh my goodness, this was good!! My daughter typically doesn’t like the taste of lemons, so I was a little worried that she wouldn’t like it. She ended up gobbling it up and did her happy dance! My husband couldn’t get enough of it either and went back for thirds. I served it diced up and on fettucini, with a side of steamed broccoli. Husband and toddler approved, so I will definitely be making this again! Thank you for such an awesome recipe! Don’t have a slow cooker but have a pressure cooker. Any idea how to convert the recipe times for a pressur cooker? Thanks in advance. I haven’t tested it so I’m not sure. You might be able to find another recipe online with similar ingredients and follow that as a guideline. Good luck! Hi i make this recipe pretty often and omg its to die for. Thank you for posting. You’re welcome, Christie! Thanks for the 5 stars! Making it for the second time! I made this yesterday. It was really good. I’ve been having problems with getting my toddler to eat and she loved it. I paired this with roasted spaghetti squash and I put the sauce on top. One note: I’m not sure if I cooked my chicken breasts a little too long in the skillet, but they were a smidget on the dry side. So next time (there will be a next time) I’ll brown them on heat that’s a bit higher and for a shorter amount of time. OR I’ll check the chicken breasts at 1.5hrs (I cooked them on high) and if they are done, I’ll add the cornstarch mixture and cook for another 30 mins (to make 2hrs total). I love when a picky toddler is won over by a meal!! It’s the best!! THIS DISH is a new family favorite!!! I made it two weeks ago for the first time and again (by request) this evening. I’ve just gotten the chance to sign up for your site and browse other recipes! I can’t wait to try out more. That’s such a huge compliment! Thank you so much for taking the time to come back and let me know.